Friday | October 13, 2017	In conjunction with Autumn Harvest 丰收之秋 at Gardens by the Bay, Bakerzin brings to the table 5 delicacies and a sweet treat! Let's check out the dishes for Autumn Harvest: #1 Crayfish Pasta - SGD21.80 Pasta in homemade tomato sauce, topped with baked cheese crayfish, you deserve a good treat! #2 Crispy Pork Chop - SGD18.80 Each flavourful crisp pork chop are marinated and seasoned to perfection, served with fragrant rice and garden coleslaw. #3 Seafood Pumpkin Curry with Fragrant Rice - SGD18.80 Stewed with prawns, squids, herbs and spices in pumpkin curry, this bowl of curry goodness is best eaten with fragrant rice. #4 Cranberry Cheddar Ham Sandwich - SGD16.80 Generous slices of premium gammon ham with a layer of cheddar cheese and cranberry relish, each bite have you wanting more. #5 Mushroom and Cheese Quesadilla - SGD16.80 Wrapped with seasoned king oyster mushrooms and cheese melts, all four slices makes a perfect meal snacker. #6 Durian Chocolate Mousse - SGD7.50 An excellent creation of pure durian bliss, glistening with a fine layer of chocolate, each bite takes you to heaven! 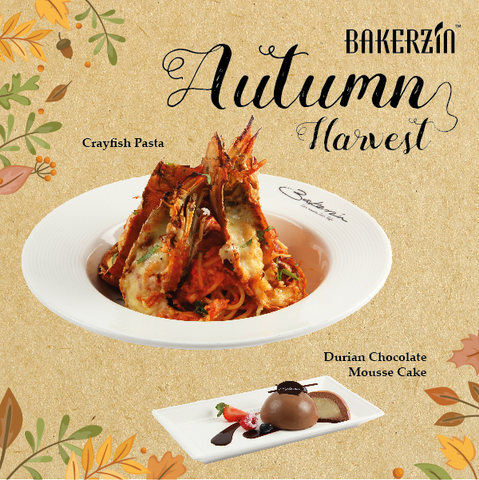 Complete your Autumn Harvest adventure at Bakerzin Gardens by the Bay today!. Hurry, before promotion ends! *Prices stated are subjected to prevailing government taxes.